Summarizing your financial records at tax time can be a tedious and lengthy process when you keep records manually. With TutorPanel you can easily generate an income statement any time and the information is up-to-date with all of your reconciled lessons. Plus TutorPanel offers other reports that can be generated daily to help you and your tutors stay on top of business. Knowing exactly how your tutoring company is performing at any point in time is easy with TutorPanel. All of your lesson fees, credits and expenses are compiled and organized into an income statement -- even fees from lessons reconciled by your teachers today are included. Know exactly which students owe you money and which students have credits or zero balances. Being able to easily view student balances helps you proactively address issues of late payments. Keep an eye on your tutoring company's performance with a financial snapshot. 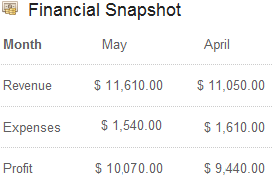 Quickly view trends in your revenue, expenses and income over the past three months. The financial snapshot appears on the home page of your TutorPanel account so you can quickly glance at your financial performance when you log into your account. 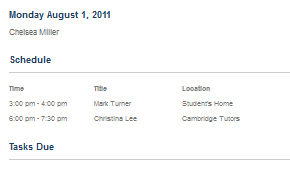 Generate daily summaries for tutors containing their schedules for the day and any tasks that are due. Tutors can also generate Daily Summaries themselves for any day of the upcoming week and print out a copy to keep with them. See updated records as lessons are reconciled by tutors. Parents & Students can view lesson notes in their accounts. Revenue is updated as lessons are reconciled. Quickly access student transaction histories and balances. All invoices are saved in an easily accessible manner.